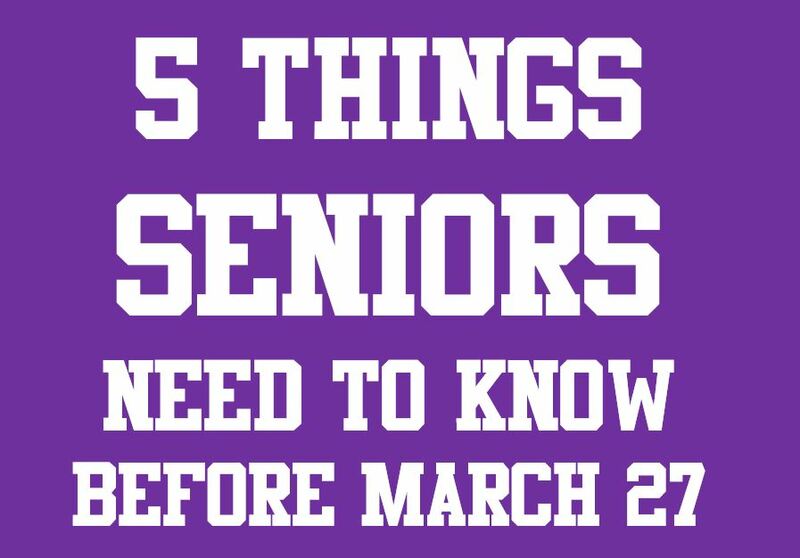 Seniors, the countdown is continuing…but there are still things you need to know about before March 27. The last chance to buy Senior Prom tickets is March 27 during all lunch periods. Tickets are $100. This covers a buffet-style dinner which will have two types of salads, chicken/filet, two types of starches and beverages. If you would like to bring someone who doesn’t attend TCHS, they must get a “date form” from either the front office, counseling office, Mrs. Kiser’s room (C113), or Mr. Day’s room (M226). These will be available starting on March 16 and will have to be completed and returned to Mr. Day before April 30. Seniors with early release during 8th and 9th period MUST see Mrs. Lebrun in the front office before 4 p.m. on March 27. These seniors require a pass from Mrs. Lebrun to be able to leave school early during end of course testing next week. Click here for a full schedule of English EOC testing on March 30 and April 1. If you’ve already been accepted into a college, please give that information to Mrs. Wimmer in the front office before Friday so she can make you a college card to place in the window. Timber Creek is in competition with the other Keller ISD high schools, so we need your information! If seniors are hoping to wear a red cord come graduation, it is necessary that they give blood at least twice this year. The next blood drive is scheduled for April 13. Seniors are free to donate blood during the school day if they have early release. Sign up in room N 208 before or after school to give blood. BONUS: We are encouraging you to wear yellow on March 27 — click here to read why.